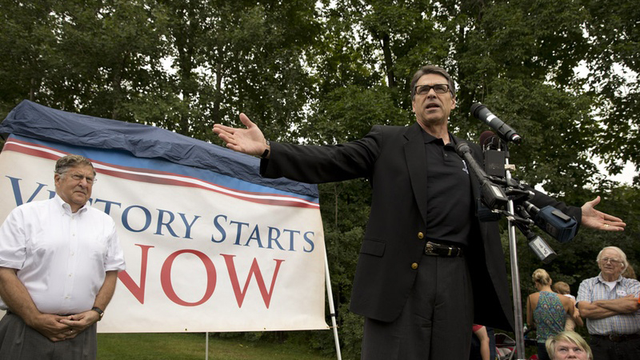 ROCHESTER, N.H. – Don’t expect Gov.Rick Perry to pay back the $80,000 in taxpayer money earmarked for his legal team. The governor, charged with coercion and abuse of power, said this week he will tap his campaign account to pay for his defense from this point forward – a reversal of his initial plans – saying that he did not want to saddle taxpayers with the cost of a wrongful prosecution. But it was unclear whether his campaign would repay the $80,000 in state funds that Texas Comptroller Susan Combs had already authorized be paid to the firm of one of his criminal defense attorneys, David Botsford. Felix Browne, a Perry spokesman, confirmed that Perry would not use his campaign funds to pay those initial bills. Asked whether the $80,000 included legal services for state employees other than Perry, Browne said he would look into it. Perry spoke to reporters in front of a barn at the fairgrounds during his two-day swing through New Hampshire. He is testing opinion in this crucial primary state as he considers whether to seek the Republican nomination for president. He plans to fly to South Carolina next week, and he told New Hampshire Republicans he will return in October. Perry was booked this week on felony charges related to his threat to veto $7.5 million in state funds for the public integrity unit of the Travis County district attorney's office. Perry wanted Travis County District Attorney Rosemary Lehmberg to resign following her drunken driving arrest and conviction. She declined and he followed through on the veto, keeping $7.5 million from the state public corruption unit that is a part of the Lehmberg's office. Perry last week called the prosecution a politically motivated farce, and said “those responsible will be held accountable.” Julie Kocurek, a Democratic district state judge, later told the Austin American-Statesman that the statement could be considered a veiled threat to the grand jurors who indicted Perry.